2018 was another record year for COPA-DATA. So how did we do? In what areas were we able to achieve success? And what objectives are driving us into the future? Here are some answers to these questions. We created more new jobs in 2018. While 2017 saw staff numbers reach around 240, that figure had risen to 270 by the end of 2018. We hired 19 new colleagues at our headquarters in Salzburg, Austria, and eleven more in our subsidiaries spread across the globe. Phillip Werr, Chief Marketing and Operations Officer at COPA-DATA, explains further: “The company’s growth is also evident from our staff numbers. The Group had the pleasure of welcoming aboard 30 new team members in 2018. At the same time, staff turnover continues to be very low, which really emphasizes to us on the management team what a fantastic workforce we have here.” In total, 154 people are working at the Salzburg headquarters, seven of whom were trainees in 2018. In addition, nine students were employed by the company to further their studies or thesis projects. Our eleven subsidiaries and 18 distributors help us to ensure that local sales and support teams for our zenon software platform are available in 51 countries. The platform is already being used successfully by more than 5,000 customers in over 155,000 installations worldwide – in both medium-sized businesses and international corporations. Our international partner network, the COPA-DATA Partner Community, has grown to more than 240 partner companies over the course of the past year. At the major Global Partner Academy event in June 2018, many of our partners joined us in Vienna for an interactive exchange of ideas. “This year has produced the strongest sales figures in the company’s history, continuing our upward trajectory of more than 30 years. Our ambitions continue to grow in line with this, so our aim in 2019 is to surpass the 50 million euro turnover mark. We are looking forward to playing a major role in helping both new and existing customers successfully put their digitalization strategies in place,” says Stefan Reuther, Chief Sales Officer at COPA-DATA. Would you like to join us on our journey and become part of the COPA-DATA family? Find out more about pursuing a career with us. 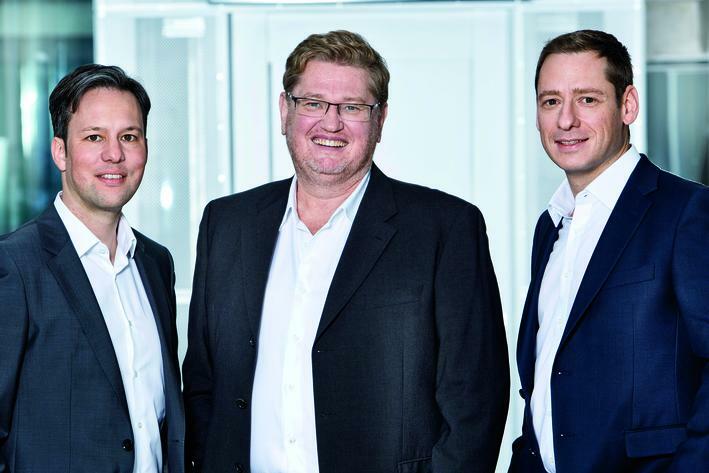 The executive trio (from left to right): Phillip Werr (Chief Marketing and Operations Officer), Thomas Punzenberger (company founder and Chief Executive Officer), and Stefan Reuther (Chief Sales Officer) see lots of potential for COPA-DATA products to play a role in digitalizing industry and the energy economy.